For those of you who have lawns, you know they are time consuming to care for in terms of water, fertilization and weed abatement. Does the grass feel spongy under your feet? Do you notice it has brown patches? The brown patches can be an irrigation problem, pest or a cultural issue. Or – it could mean that your lawn has thatch. The sponginess usually means it has thatch. There is a lot of information on the web about what causes thatch and how to deal with it and I’ve pooled this information together for this blog entry. It’s a timely topic because now is the time you may be able to prevent it. A dense layer of living and dead plant material lying between the soil surface and green grass leaves. Over time this accumulation of partially decomposed matter will become thicker and increasingly resistant to moisture. Leaf blades and grass clippings don’t contribute to thatch because they break down readily, returning the nutrients to the soil. Grass clippings are beneficial. When the build-up of plant material are produced faster than they are breaking down thatch is formed. When thatch becomes thicker than ¾” it restricts the intake of water and nutrients making the lawn more susceptible to insect and disease problems. Here’s an important point – as thatch gets thicker, it is comprised of more roots. These roots are not able to reach the soil, thus, your lawn will not receive moisture from the soil and these areas will turn brown. Improper mowing: good rule of thumb – No more than one-third of the grass blades should be cut at a time. When a lawn is “scalped” (more then 1/3 grass blade removed) the grass is weakened and can turn yellow or brown. Some grasses are more likely to form thatch than others. 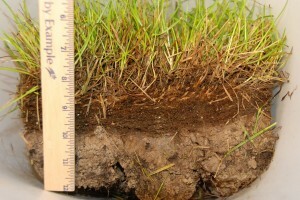 Bermuda grass, for example, has a high tendency to produce thatch. Watering that is frequent, but shallow or over watering means there is less oxygen for roots and thatch layer does not decompose sufficiently. This creates shallow roots which is a cause of thatch. Best is to water less frequently, but deeply. Best time for thatch removal is spring or fall. If thatch is thick you should use a vertical mower with blades that are perpendicular to the turf surface. I would advise you to hire a professional to remove thatch, or ask Gardeners’ Guild about your thatch problem. I simply want to mention I’m very new to weblog and absolutely enjoyed this web blog. Probably I’m want to bookmark your blog . You absolutely come with tremendous posts. Thanks for revealing your web site.